Georgies' series of Monday (Portland store) or Saturday (Eugene store) free classes are for teachers or parent helpers in K-12 school programs. We created them to answer the basic questions like "Yikes, clay! What do I do now?" 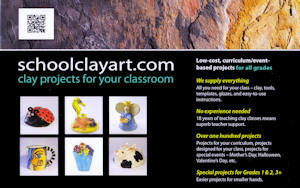 We have only two requirements for these classes: first, they should be taken in order from Clay 101 to 201 to 301. Second, no more than three people from any one school can attend the series at one time, so we can accomodate as many schools as possible. Please note: due to demand and space restrictions, class participants must be from K-12 regional public school districts or accredited private schools. We're very sorry, but we can't include pre-K and home school teachers this year. Texture Mats - you choose! This first class covers the three necessary elements of any work with clay: forming, glazing and firing. Our projects in this class are made with Wonder White lowfire earthenware and Duncan Concepts. We model clay heads to learn about forming clay and adding attachments, design with clay colors and glaze by making tiles with Concepts underglazes and clear glaze on top, and we learn how to fire an electric kiln without fear by learning the temperatures, how to load, and how to make it all work! Come prepared to work! We begin with basic slab work and learn to make tiles. From a slab, we move to hump and slump forms to create birdhouses, a fun form that includes the basics of handbuilding like scoring and attaching bases and lids. Our slabs and tiles offer us a substrate to explore underglazes. Because we are working on raw clay, we get to use engobes and two fun techniques that include faux mosaic portraits and marbelizing. Last, but certainly not least, we begin our clay conversation of learning how to build hollow. Modeling clay bugs is fun for all ages on its own, but this technique is also a stepping stone for the #3 class. You'll be introduced to more than clay in our number three class as you explore a timeline in clay history. Travel back to make clay plaques from cave paintings, followed by a wealth of interesting projects from ancient Egypt: hieroglyphic tables and stamps, and beads from Egyptian paste. 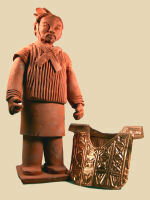 Our travels take us next to ancient China to make terra cotta warrior figures. Both the Greeks and Native Americans from the Southwest used a method of decoration called terra sigillata, and we'll give it a try too. We introduce you to copper and aluminum foils for repousse, and fun materials for bug wings too. If time permits we have even a few more ideas, so wear your clay clothes! 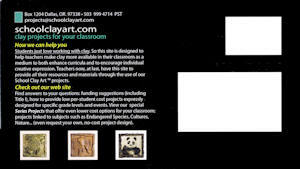 Teachers' classes are free with a signed registration agreement. Class fees may be billed to your school if you miss the class without cancelling in advance. If you must cancel your registration, please call us as soon as possible. We almost always have waiting lists for these classes, and your call will allow someone else to attend. Thanks for your help! Kids just love working with clay! When you're ready to tackle clay projects in your classroom (with the help of our classes! ), we're happy to offer these resources as sources for projects and ideas. Click the thumbnails for larger copies of their postcard.